President Obama is doubling-down on failure. He is selecting yet another academic ideologue with no job-creating experience to be the top cheerleader for his job-destroying tax, borrow and spend agenda. Alan Krueger may have academic prowess, but his support for big-government, job-killing tax policies like the Value Added Tax and cap-and-trade shows just how out of touch he is from economic reality. 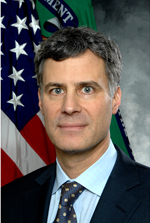 With millions of jobs lost and trillions of dollars added to the national debt, Alan Krueger’s chief advice at the Obama Treasury Department has now earned him the top economic post in Team Failure. Ivory Towers are a far cry from Main Street America. It’s time for President Obama to stop studying classroom economic theories and start understanding real world economics of what it takes to run a small business, meet payroll and hire more workers. If President Obama is serious about job creation, he will end his assault on the free enterprise system by rolling back burdensome regulations, cutting government spending and debt and lowering taxes to free America’s job creators to save, invest and hire more workers. More employed Americans means more people investing in the economy and paying sustaining dollars into Social Security and Medicare. The key to solving America’s economic crisis is employment through entrepreneurship – not more government. The American people don’t need more failed liberal economic theories; they need sustainable jobs based on proven pro-growth policies for job creation. America needs a leader with job-creation experience. For millions of unemployed Americans, the 2012 elections can’t come soon enough.